You may find this hard to believe (as I did) that the number of household MILLIONAIRES in the U.S. is actually on the rise. A little research bears this impossible to believe story to be close to true. 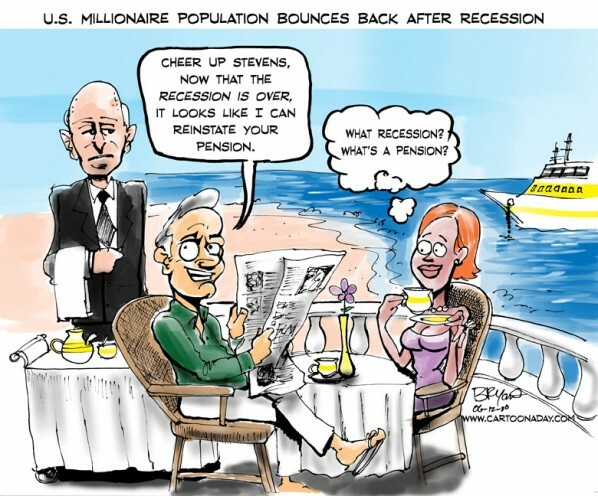 Reports indicate that at the end of 2009, the U.S. had a whopping 11.2 million MILLIONAIRE households!!!!!! Don’t believe it? Me neither. But that figure is actually an increase of 14% from 2008. H-O-L-Y C-O-W! IF THIS IS, IN FACT, TRUE, it means that America has 4.7 MILLION households (yes that’s not a type-o) in the Millionaire bracket. Unbelievable but true. Not surprisingly, this puts the U.S. as the largest number of millionaire households in the WORLD. (4% of All American are Millionaires!!!!!!!) Singapore has the highest millionaire density at 11%. Makes me wonder why I’m not a millionaire yet. Could it be that I spend an inordinate amount of time creating unique content for a totally FREE BLOG? A millionaire couple sits on a balcony overlooking the ocean and a yacht having coffee. They make fun of their butler standing nearby. Inspiration: Inspired, as always, by recent news events and the ridiculousness of richness.